First up I added some sponge chipping using Model Color Medium Sea Grey. I was quite random about this. This is a much faster way than using salt for chipping but the effect isn’t as fine. Decals are next after a gloss coat. 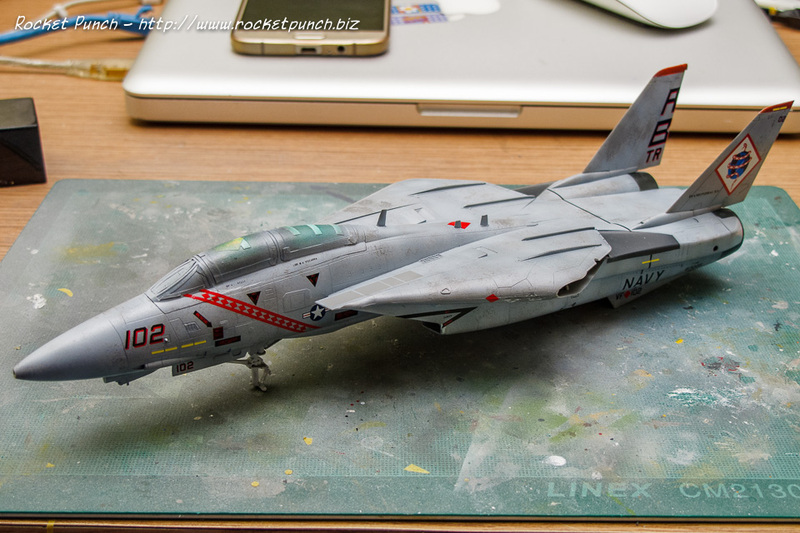 The markings are from Cam Decals’ Tomcat Alley: Grumman F-14B Tomcat 72-046. 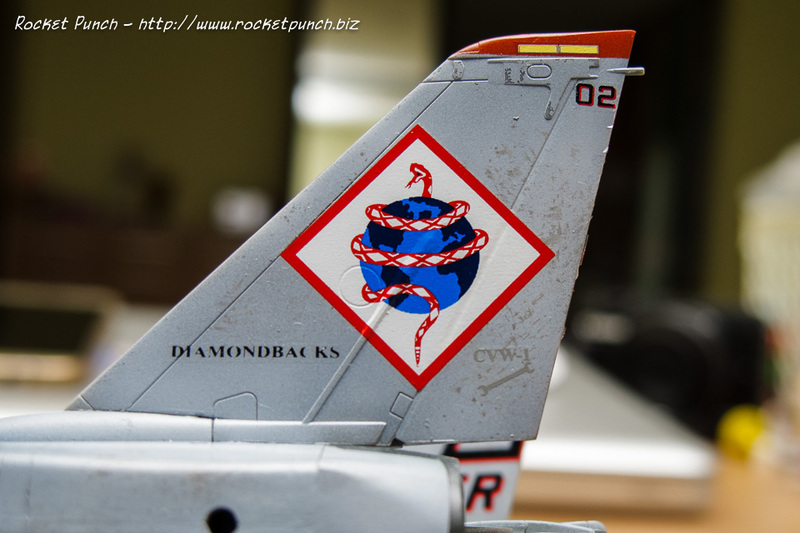 The VF-102 Diamondbacks F-14 depicted here was one that operated during Operation: Enduring Freedom in 2002. 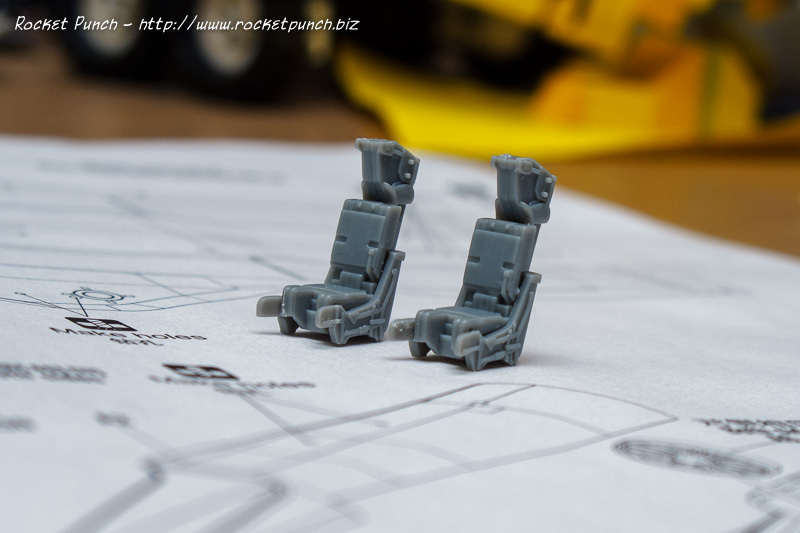 The decal was printed by Microscale. Alas, quality isn’t great: fidelity is not quite there, some looked oversized and some shattered/tore when I tired to re-position them. One of those that tore was the 3 diamond marking on the wing gloves which had to conform to curves. I ended up removing the torn pieces that also lifted the paint underneath. So I sanded them down, masked (using the remaining good decal as a template) and painted the diamonds. Some touch-up was done by handpainting. The placement guide was also not very clear as the panel lines shown in the instructions don’t quite match the ones on the kit so I ended up guesstimating some of the locations. Once properly cured though, they do look very good. I decided not to put any of the small stencils. After another gloss coat to seal in the decals, I proceeded with panel lining with Raw Umber oil paint. The oil paint was quickly brushed onto all the panel lines and wiped away with a turpentine-soaked tissue to leave the panel lines filled. 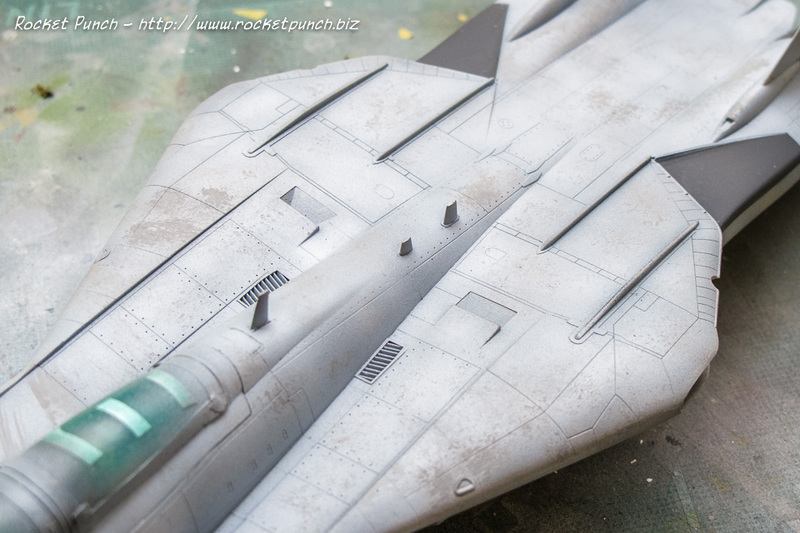 After that I randomly filtered the panels, paying more attention to the rear fuselage and wings. I also added streaks on the wings with oil paint. I was given a tip by my friend Max (from Out There) that streaks can be done with a normal 6B pencil. I gave it a try here by lightly adding squiggles and used a cotton bud streak the graphite. Looks good. But I decided to keep it light and move on. Next were attaching the ‘things under the wings’ which I worked from inside outwards. The GBU-12s were first, then the drop tanks, then the gear bay doors, then the AIM-7 and LANTIRN, and lastly the AIM-9s. 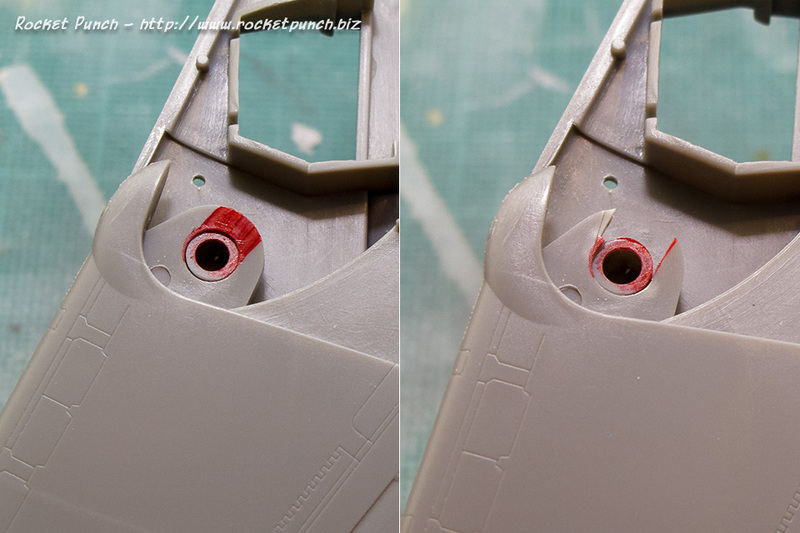 The gear doors’ red trims was done with a red permanent marker. The wheels were then attached and I’m close to the finish line. I hope when I attach the wings they won’t be scratched up too much. 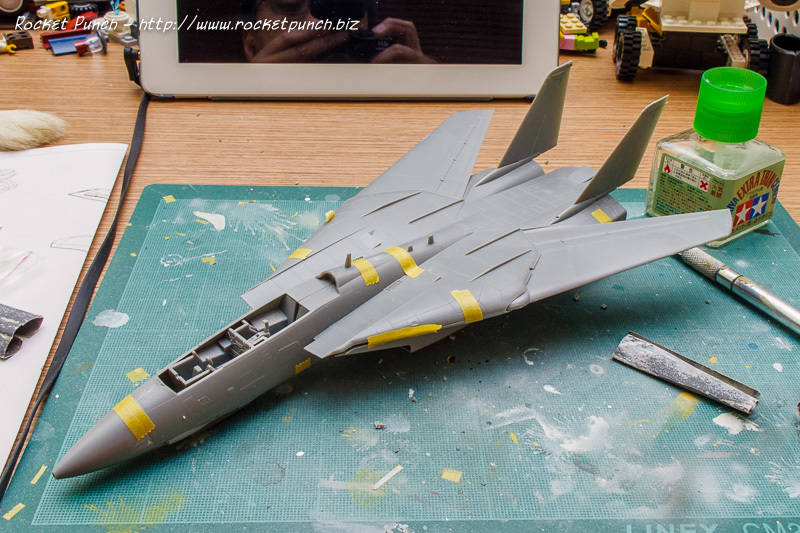 Work (finally) continues on the F-14. Surprise surprise, the first thing to be tackled is the cockpit. 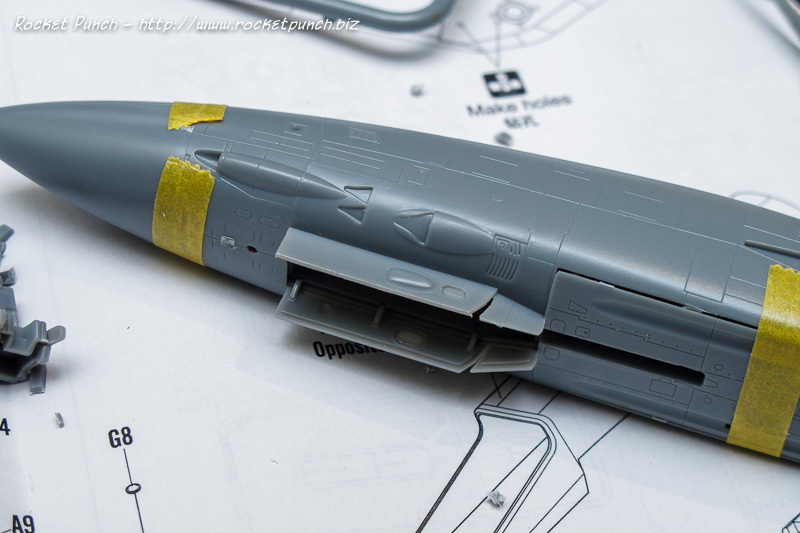 I first sprayed Vallejo Air Dark Sea Gray thinking that it’s a match to FS36231 (the standard interior color for modern US jets) but it was too dark. So I ended up spraying my usual Vallejo Air US Gray over and be done with it. 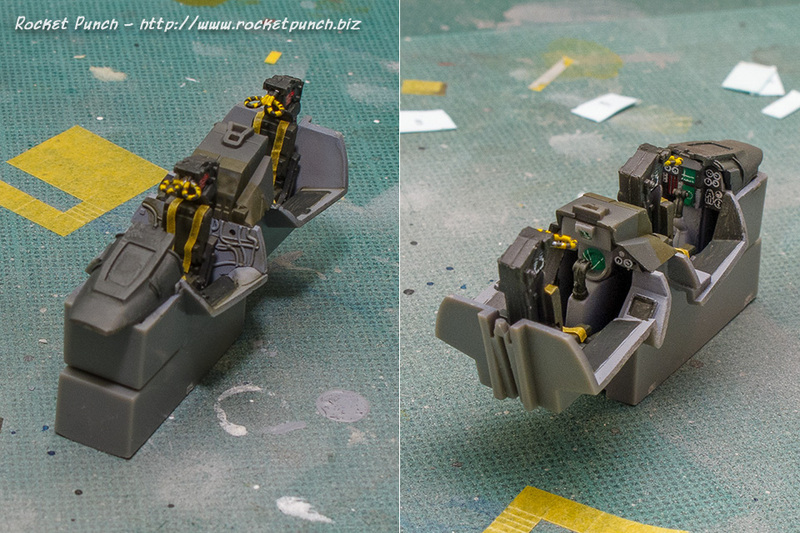 The ejection seats are given a base of Vallejo Air Black Grey with the details handpainted on. I also added seatbelts made out of 1mm width masking tape. 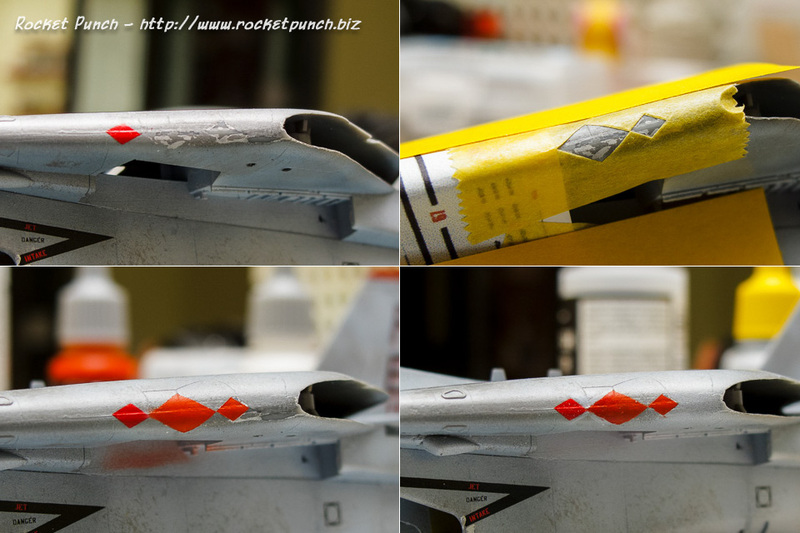 The instruments are all provided as decals. Some people really have a problem with this. I’m not one of those though. However, the side consoles have no details on them. Nor are there decals provided, which is very strange. With the canopy closed, this isn’t a serious issue. But still, it’s lazy on Hobbyboss’ part. 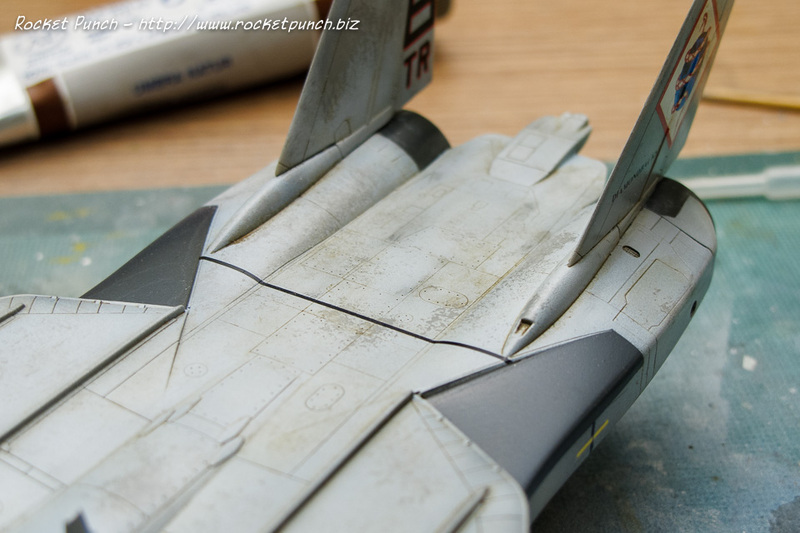 To ease painting, I cut out a section of the connector on the wing. The wings can now be removed and snapfit back in. Next I tried to fix the intake gap issue. 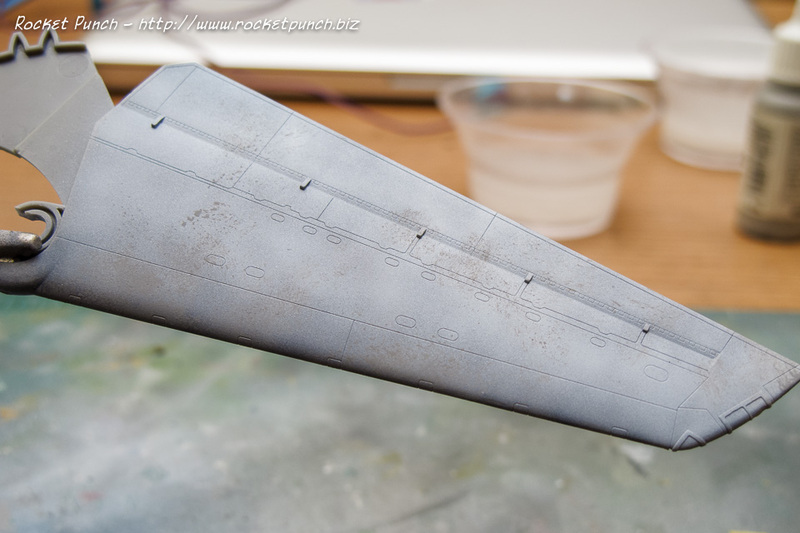 The seamlines here are quite obvious and I decided to run some Vallejo Plastic Putty into them to remove as much of the very visible gaps as possible. It’s a bigger issue further inside the intakes. For now, these are left as is until I find a better way to fix them. 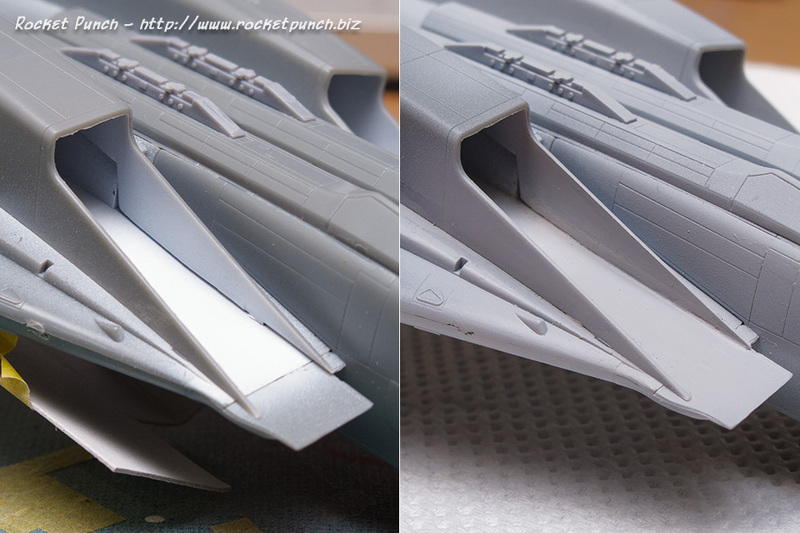 A glaring mistake for most people who knows the F-14 would be the missing air intake ramps. After looking at photos, I noticed that there’s a distinct demarcation line inside the intake that splits the gray and white colors. So I inserted masking tape the best I can and hope for the best. The canvas covers on the instrument shrouds were painted in Green Brown and the seats were attached. I think the restraints look a bit too thick but I’ll live with it. The canopy had a center seamline which was cleaned up and then had a dip in Future. It was then masked off and cemented onto the fuselage. The front section of the canopy needed some sanding and finessing to fit flush. To add to the patched up effect, I sprayed randomly onto the kit with leftover paint from other projects I was doing concurrently. 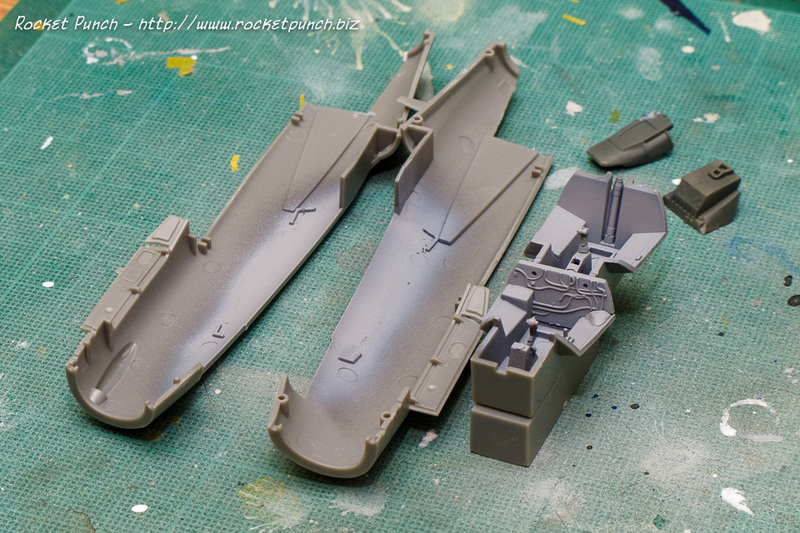 I also made sure to spray Black Grey onto the canopy frame before main painting begins. Mig AMMO Light Compass Ghost Gray is used for the main color. 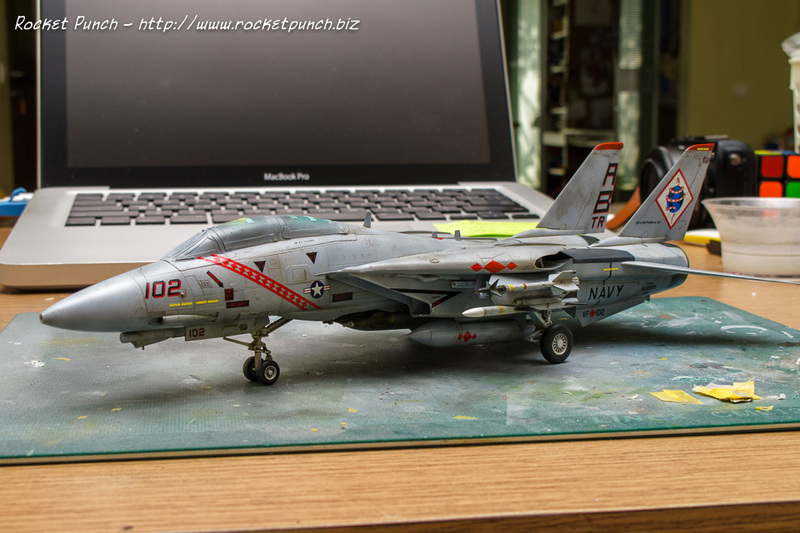 Unlike most F-14s of this era, this particular VF-102 Tomcat is conveniently a single color overall. I went light on the trigger this time to make sure the patched up paint underneath will show through. As for the Mig AMMO paint, it comes in the same bottle style as Vallejo, has a steel BB inside for easy mixing, looks grainier than Vallejo but went on very nicely and easily slightly thinned. It however has a slight smell that’s not pleasant. The next project is a new kit instead of finishing a shelf queen. 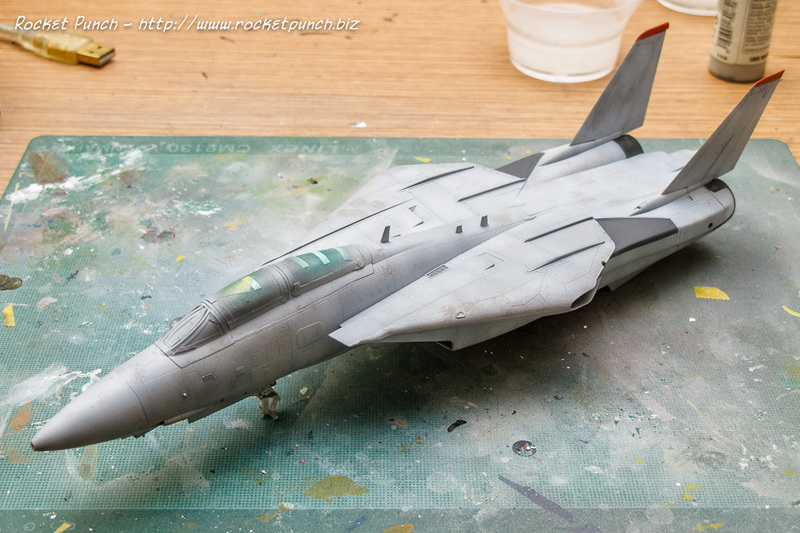 My friend said that this kit was quite straightforward compared to the Hasegawa. Let’s see shall we? First impressions are good so far. 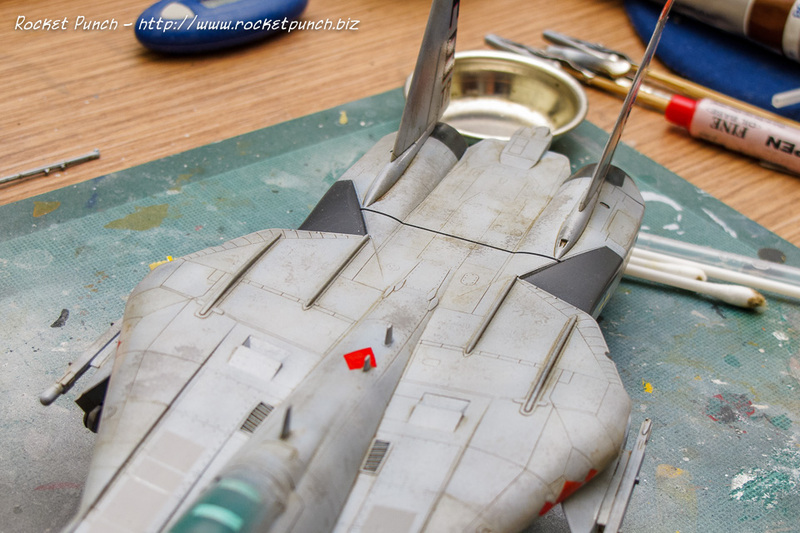 The panel lines aren’t as fine as Hasegawa’s but aren’t as deep as the Revell’s. Shape looks alright too. 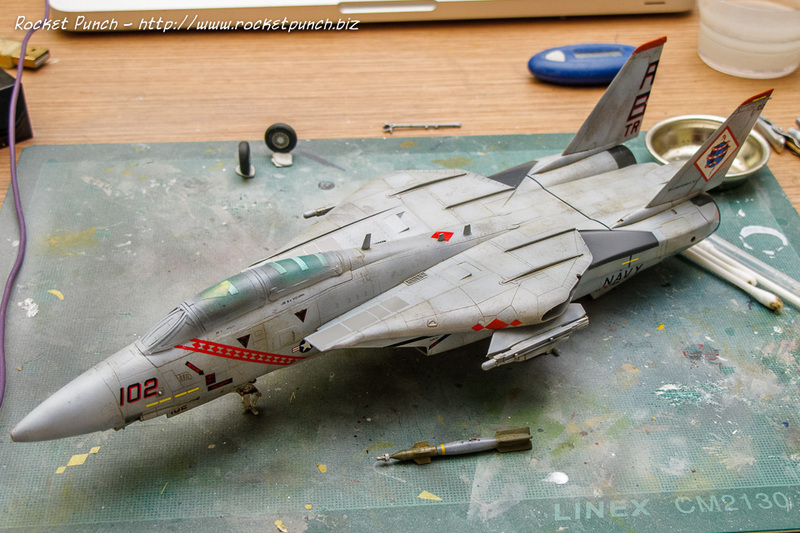 Best of all, unlike Hasegawa, Hobbyboss went the route of remolding whole pieces for the various F-14 versions instead of changing a small panel here and there which should make for less fiddly fitting. Anyway first up is a quick wash with soap as the kit is covered with a coat of mold release. 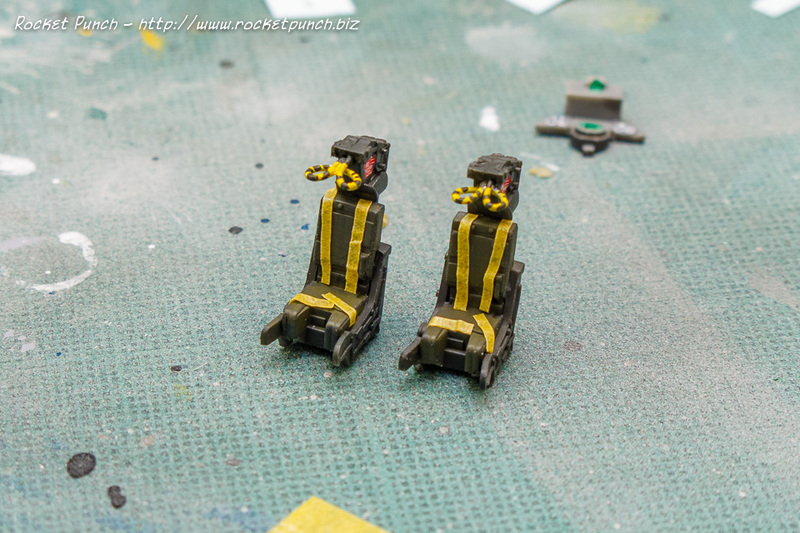 I then assembled the ejection seats. It wasn’t surprising that there are no molded-on seat belts but disappointingly, the very prominent ejection handles on the headrests are missing. In addition, the back cushion also looks off but I’m not too concerned with it. I decided to do something about the missing ejection handles. I remember reading about a simple method of scratchbuilding the handles by using some wire and a custom jig from Andy Mullen’s site (since offline). The custom jig is made of 2 straight sections cut from a straightened paperclip that were hammered into a wooden base. Then it’s a simple matter of threading a brass rod (mine is a Wave Option System C-Line 0.5mm) through the jig and adjusting to taste with pliers. The handles look slightly oversized to my eye but barring finding a thinner wire, I think I’ll go with these. After some more adjustments, they should look fine behind a coat of paint and under the canopy. This was actually a 2nd attempt at it. 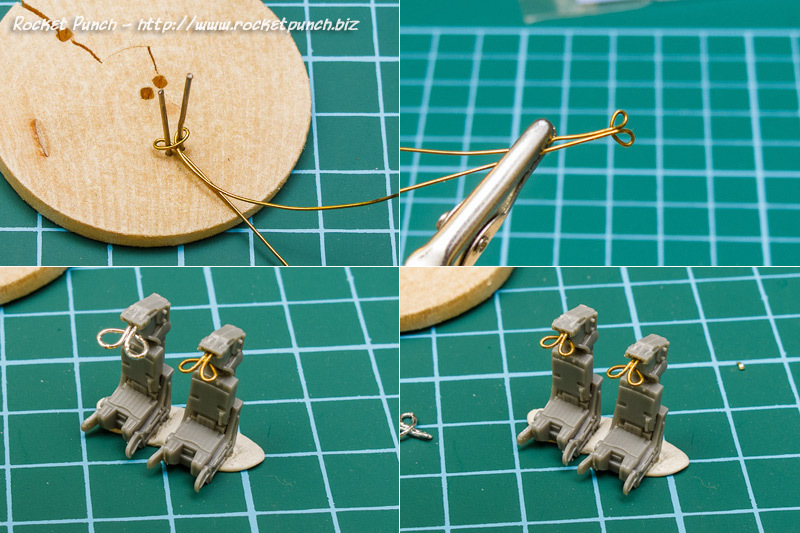 I initially used nails for the jig and craft wire for the ejection handles but the result looked more appropriate for a 1/48 scale seat (the silver handles in the below pic). Since this is an F-14B, the gun vents are the correct NACA version. Also of note here is that the nose gear doors are molded on! Excellent for those who want to model this kit with the gear down, but pretty much a non-starter for folks who want to build this in-flight. 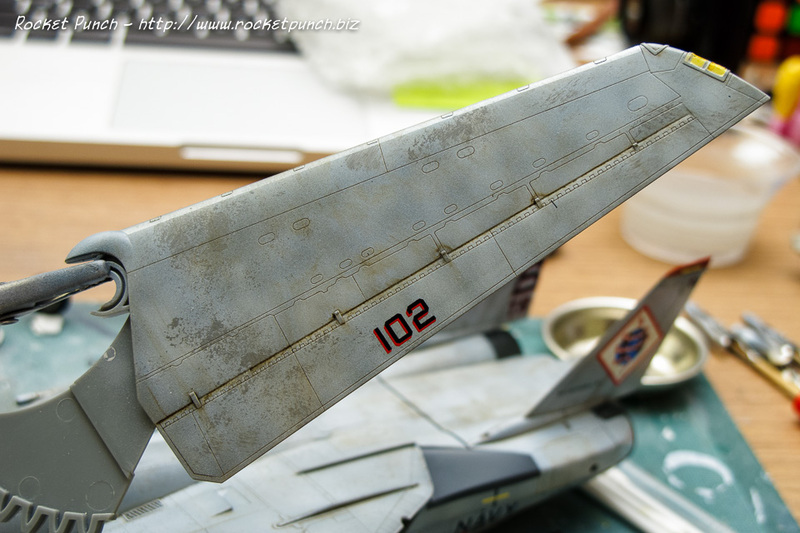 The ECM blister on the gear door is also correct for the F-14B. 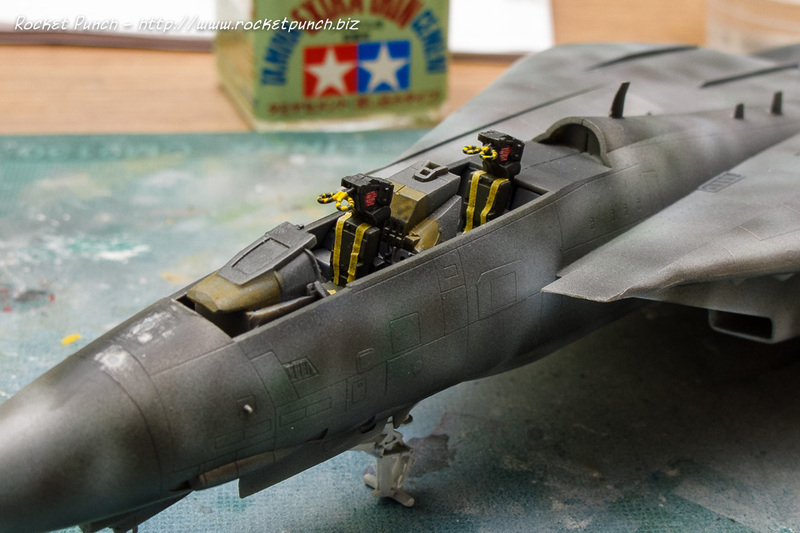 Most impressive is Hobbyboss molded the reinforcement plate surrounding the co-pilot’s step which is a feature on the F-14B. 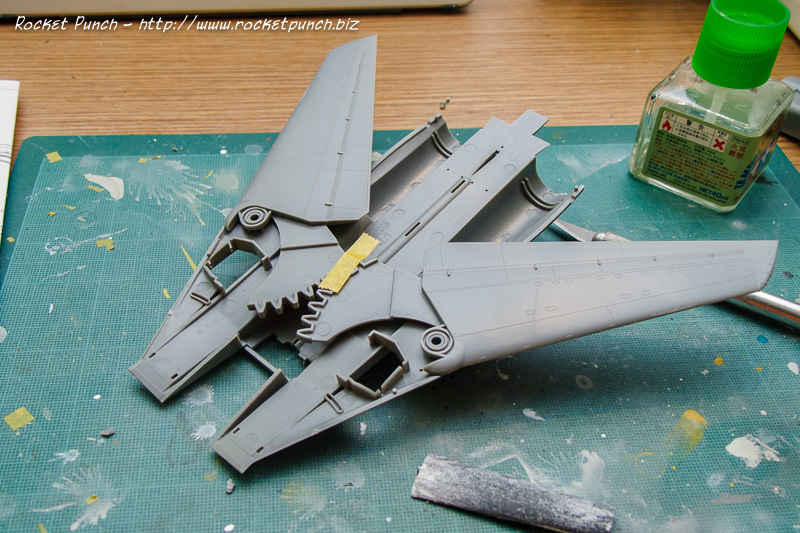 The wings are designed to swing in and out which I don’t care much for since I prefer how the F-14 looks with wings swept anyway. I think I’ll need to figure out a way to modify the wings so that I can attach after painting though. I then decided to do a quick dry fit to see how well the kit comes together: so far so good! 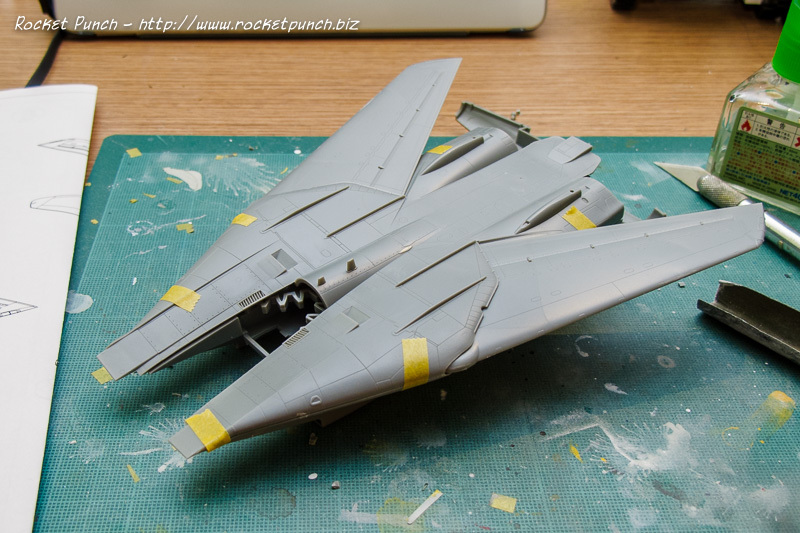 More importantly, looks a lot like an F-14 Tomcat to me! 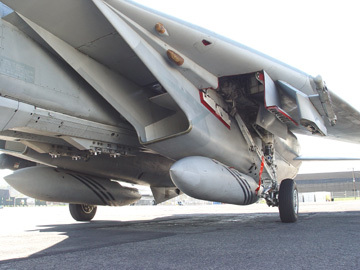 In the 1990s, the F-14 was adapted to drop bombs and the starboard weapons pylon was modified to have a LANTIRN pod mounted for precision strike. The kit includes the LANTIRN-specific vertical pylon but doesn’t come with the LANTIRN pod itself and the attachment rail for the pod. 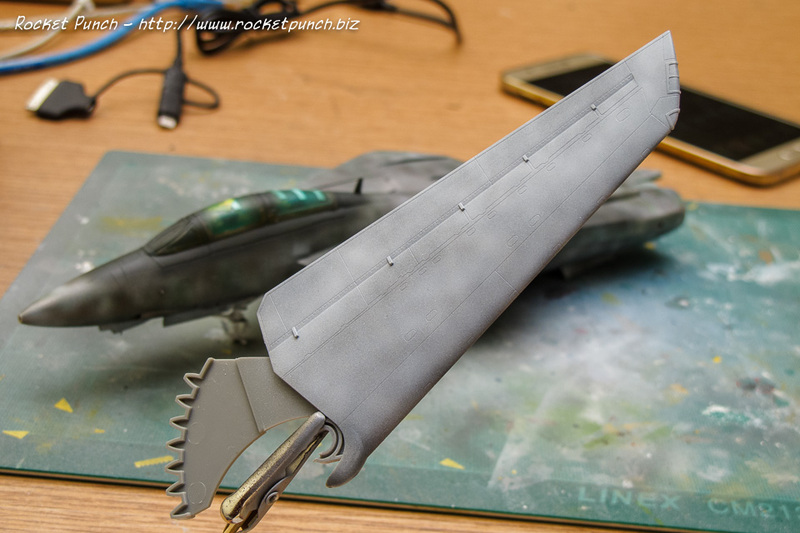 I got a LANTIRN pod and pylon from the Hasegawa Weapons Set VII. 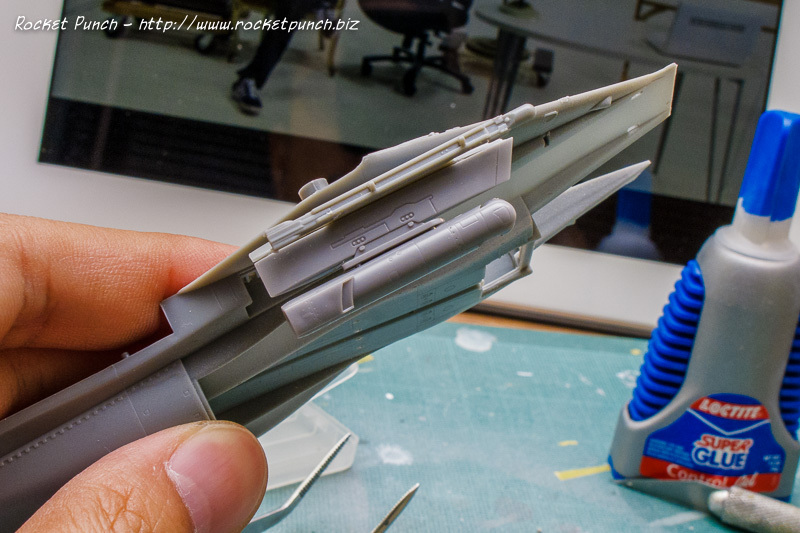 The Hasegawa pylon fits about 5mm longer than the shoulder pylon but I don’t think it’s a deal breaker. 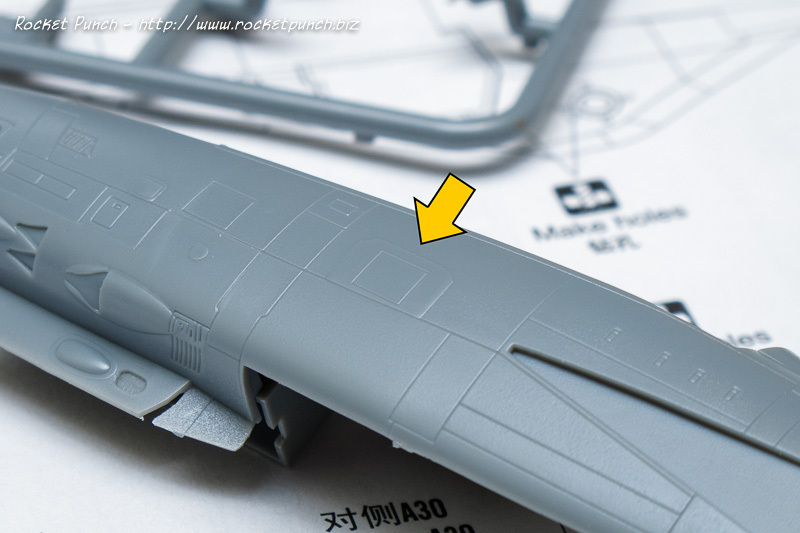 Hobbyboss also includes some nicely done LAU-138 BOL missile rails which is accurate for the F-14 in the 1990s onwards. 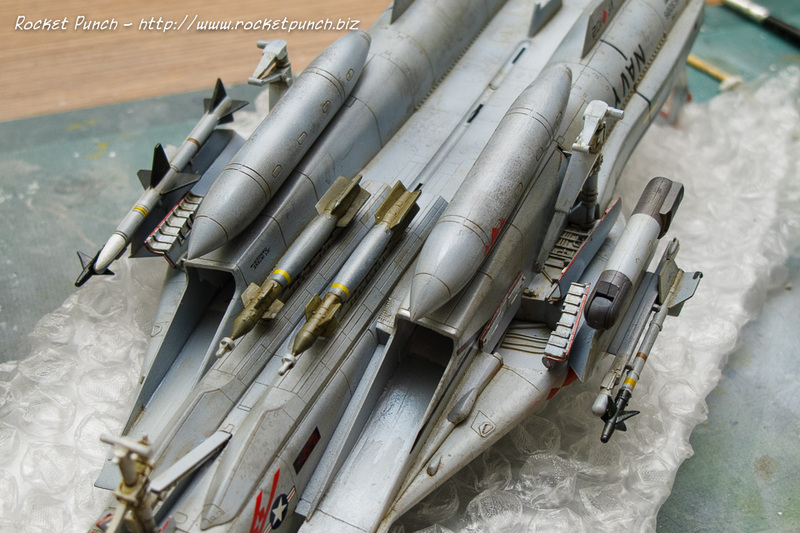 Another detail that Hobbyboss missed are the bomb racks on the underbelly missile palettes. 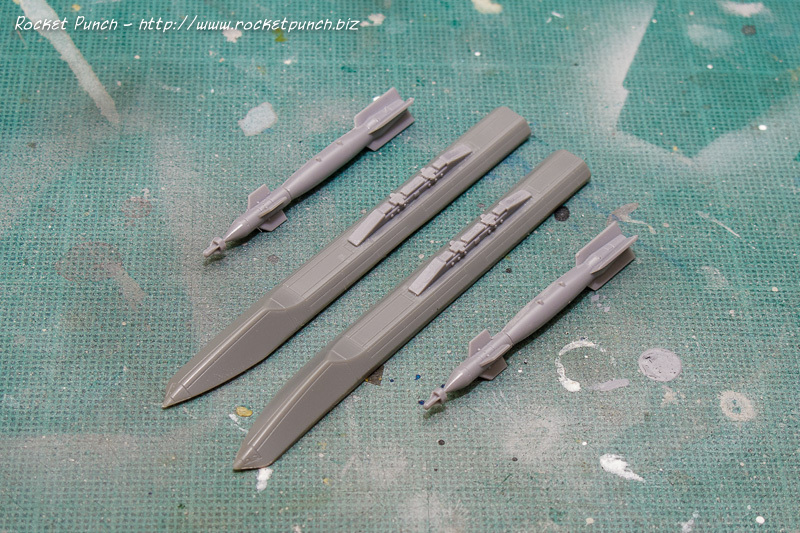 I also got these from the Hasegawa Weapons Set VI. I’m going ahead with only the 2 forward ones mounted with 2 GBU-12s, which is one of the more common configurations for the F-14B in the 2000s. 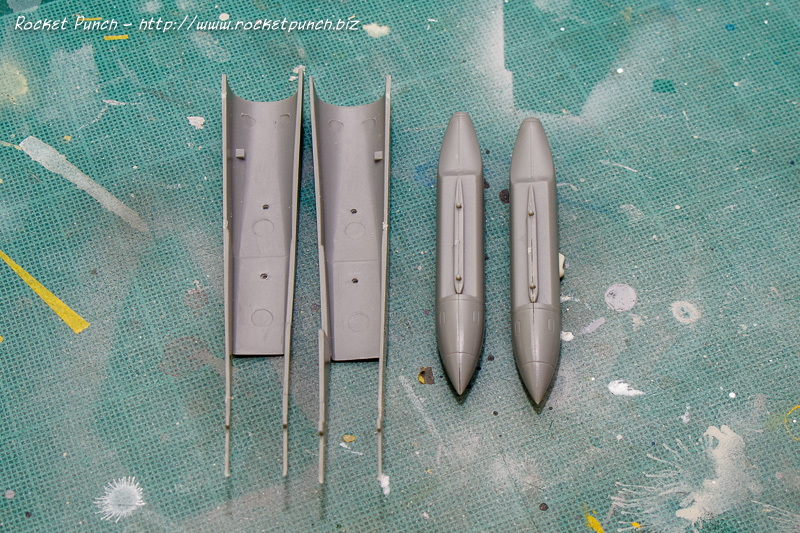 Hobbyboss has molded identical looking fuel tanks which have center aligned pylons. The pylons are supposed to be offset to one side. It’s a hassle to try to correct and since they aren’t obvious when mounted, I left them as is. So most of the major components have been dealt with, next comes proper assembly.